UNCTAD data show that, in 2015, 46 countries and economics adopted at least 96 policy measures affecting foreign investment. Of these measures, 71 related to the liberalization and promotion of investment, while 13 introduced new restrictions or regulations on investment (the remaining 12 measures are of a neutral nature). 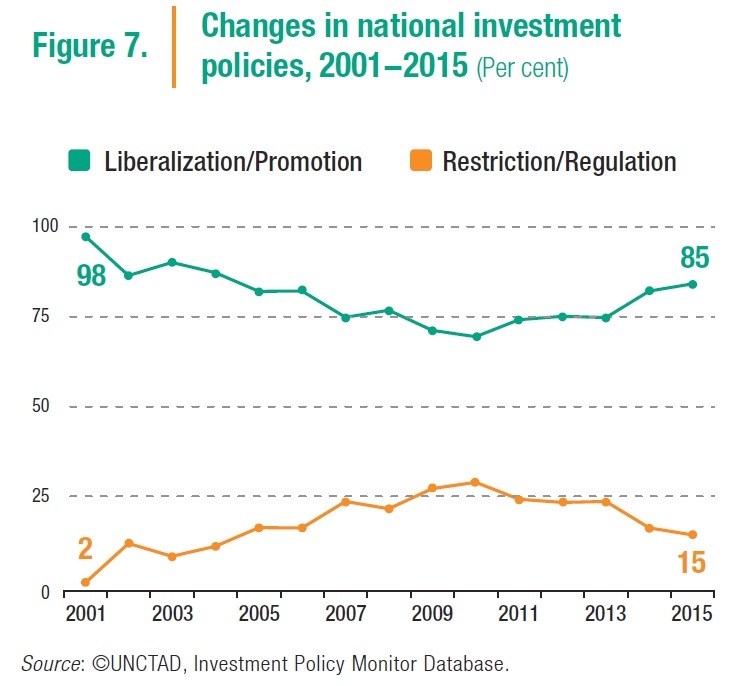 Liberalization and promotion accounted for 85 per cent of investment policy changes, which is above the average of the last five years (2010–2014) (figure 7). Entry restrictions for foreign investment were eased or eliminated in a broad range of industries (e.g. aviation, financial services, mining, real estate). Some countries pursued privatization policies, in particular in infrastructure sectors. Others improved business licensing procedures, established special economic zones or provided other forms of investment incentives. Another noteworthy feature was the adoption or revision of investment laws, mainly in African countries. Newly adopted investment restrictions or regulations largely reflected concerns about foreign ownership in strategic industries or agricultural land. There is a trend towards tightening screening procedures for investments in these sectors. In recent years, national security considerations have gained prominence in investment policies. More countries have adopted legislation in this area or have reviewed foreign investment projects on grounds related to national security. This has a number of policy implications. First, countries use different concepts of national security, ranging from a relatively narrow definition to broader interpretations that extend investment review procedures to critical infrastructure, strategic industries and/or national-interest considerations. Second, countries follow different approaches when restricting foreign investment due to national-security considerations, ranging from formal restrictions in specific sectors to complex review mechanisms that provide the review bodies with ample discretion. Third, review procedures can differ substantially in their disclosure requirements for foreign investors. Governments’ space for applying national security regulations needs to be balanced with investors’ need for transparent and predictable procedures. 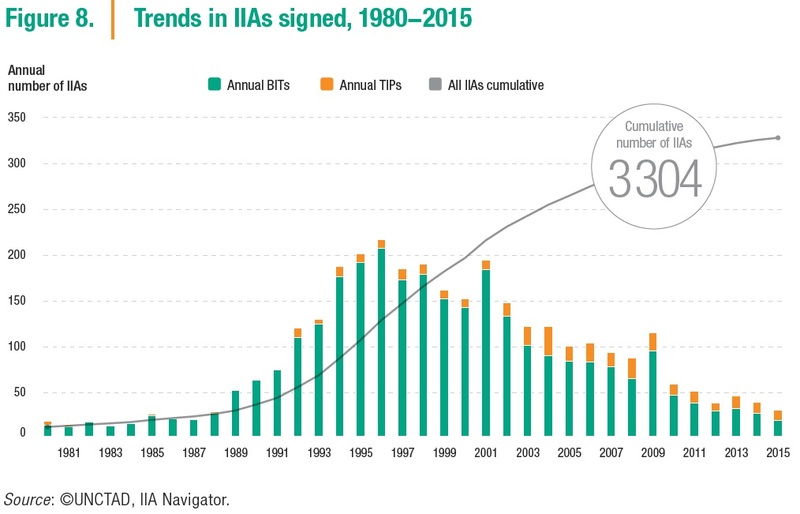 With the addition of 31 new international investment agreements (IIAs) – 20 bilateral investment treaties (BITs) and 11 treaties with investment provisions (TIPs) — the IIA universe grew to 3,304 agreements (2,946 BITs and 358 TIPs) by year-end (figure 8). Although the annual number of new IIAs continues to decrease, some treaties involve a large number of parties and carry significant economic and political weight. Recent IIAs follow different treaty models, and regional agreements often leave existing bilateral treaties between the parties in force, increasing complexity. Countries most active in concluding IIAs in 2015 were Brazil with six, Japan and the Republic of Korea with four each, and China with three. Brazil is taking a new approach to BITs, focusing on investment promotion and facilitation, and on dispute prevention and alternatives to arbitration. The first four months of 2016 saw the conclusion of nine new IIAs (seven BITs and two TIPs), including the Trans Pacific-Partnership (TPP) Agreement, which involves 12 countries. By end-May 2016, close to 150 countries and economies were engaged in negotiating at least 57 new IIAs (including megaregional treaties such as the Transatlantic Trade and Investment Partnership (TTIP) and the Regional Comprehensive Economic Partnership (RCEP)). At the same time, some countries terminated their IIAs in 2015. Typically, however, by virtue of survival clauses, investments made before the termination of these IIAs will remain protected for periods ranging from 10 to 20 years, depending on the relevant provisions of the agreements and the terms of termination. 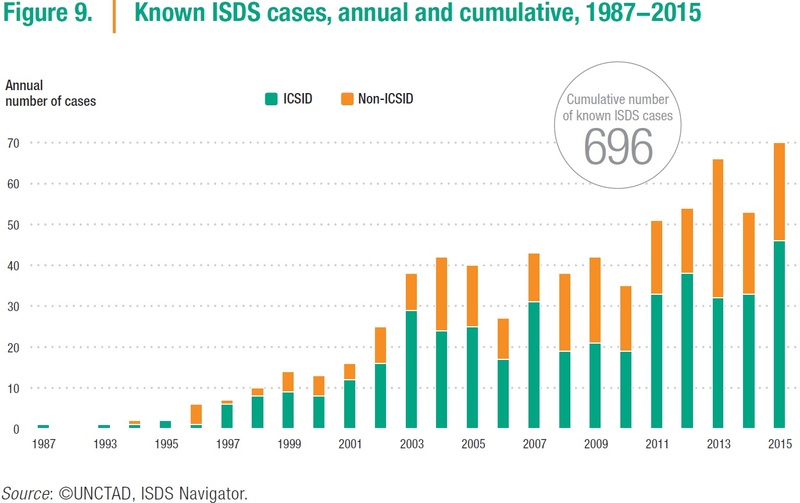 In 2015, investors initiated 70 known ISDS cases pursuant to IIAs, which is the highest number of cases ever filed in a single year (figure 9). As arbitrations can be kept confidential under certain circumstances, the actual number of disputes filed for this and previous years is likely to be higher. As of 1 January 2016, the total number of publicly known ISDS claims had reached 696. One hundred and seven countries have been respondents to one or more known ISDS claims. Following the recent trend, a high share of cases (40 per cent) was brought against developed countries, including many cases by European investors against European Union member States. The majority of new cases were brought under BITs; the Energy Charter Treaty was invoked in about one third of cases. Publicly available arbitral decisions in 2015 indicated that States often prevailed at the jurisdictional stage of proceedings, and investors won more of the cases that reached the merits stage. Reform to bring the IIA regime in line with today’s sustainable development imperative is gaining momentum. A new generation of investment treaties is emerging. In 2015, UNCTAD’s WIR laid out a road map for IIA reform, providing six guidelines, addressing five reform areas, and outlining options for action at four levels of policymaking. UNCTAD’s Investment Policy Framework and its Road Map for IIA Reform are shaping key reform activities. At the national level, numerous countries are reviewing their IIA network and/or developing a new treaty model. About 100 countries (including those that undertook a review as part of the Regional Economic Integration Organization (REIO)) have used the UNCTAD’s Investment Policy Framework to reassess their IIA networks. About 60 of these have used the Framework to design treaty clauses. At the bilateral level, the reform drive is most prominently reflected in the negotiation of new IIAs. Most of the treaties recently concluded include several sustainable-development-friendly clauses. At the regional level, IIA reform actions include collective treaty reviews and IIA action plans, which can result in common IIA models, joint interpretations, renegotiations, and/or the consolidation of treaties. Megaregional agreements could consolidate and streamline the IIA regime and help enhance the systemic consistency of the IIA regime, provided they replace prior bilateral IIAs between the parties (WIR14). During this first phase of IIA reform, countries have built consensus on the need for reform, identified reform areas and approaches, reviewed their IIA networks, developed new model treaties and started to negotiate new, more modern IIAs. Despite significant progress, much remains to be done. First, comprehensive reform requires a two-pronged approach: negotiating new, more modern IIAs, but also modernizing the existing stock of treaties. Second, reform has to address the challenge of increasing fragmentation: only a common approach will effectively and efficiently deliver an IIA regime in which stability, clarity and predictability help achieve the objectives of all stakeholders. Unlike the first phase of IIA reform, where most activities took place at the national level, phase two of IIA reform will require countries to intensify collaboration and coordination among treaty partners to address the systemic risks and incoherence of the large body of old treaties. The 2016 World Investment Forum offers the opportunity to discuss how to carry IIA reform to the next phase. Facilitating investment is crucial for the post-2015 development agenda. Facilitation is different from investment promotion. Promotion is about marketing a location as an investment destination and is therefore often country-specific and competitive in nature. Facilitation is about making it easier for investors to establish or expand their investments and to conduct their day-to-day business. Investment facilitation can include improvements in transparency and information available to investors; work towards efficient and effective administrative procedures for investors; enhancing the consistency and predictability of the policy environment for investors through consultation procedures; and mitigating investment disputes through ombudspersons. To date, national and international investment policies pay relatively little attention to investment facilitation. From the 173 new investment promotion and facilitation policies that were introduced around the world between 2010 and 2015, only a minority relate to investment facilitation. At the international level, concrete investment promotion and facilitation actions are either absent or weak in the great majority of the existing 3,304 IIAs. UNCTAD’s Global Action Menu for Investment Facilitation, which builds on UNCTAD’s 2012 Policy Framework and its rich experience and practices of investment promotion and facilitation efforts worldwide over the past decades, responds to this systemic gap in investment policies. It consists of 10 action lines that provide over 40 options for investment policymakers to adapt and adopt for national and international policy needs. The Action Menu includes measures that countries can choose to implement unilaterally and options that can guide international collaboration or can be incorporated in IIAs. Any investment facilitation initiative cannot be considered in isolation from the broader sustainable development agenda. It is important to address weaknesses in investment facilitation capabilities where they exist in developing countries. Effective investment facilitation efforts should be an integral part of the overall investment policy framework (including regulation, liberalization, protection and promotion) aimed at maximizing the benefits of investment and minimizing any negative side effects or externalities.